Joining Samsung, budget TV maker Vizio will be deploying Apple's AirPlay 2 to its TVs starting early this year. The option will first arrive this quarter for U.S. and Canadian beta testers of Vizio's SmartCast 3.0 platform. It will go live for all SmartCast-equipped TVs in the second quarter as a free software update. 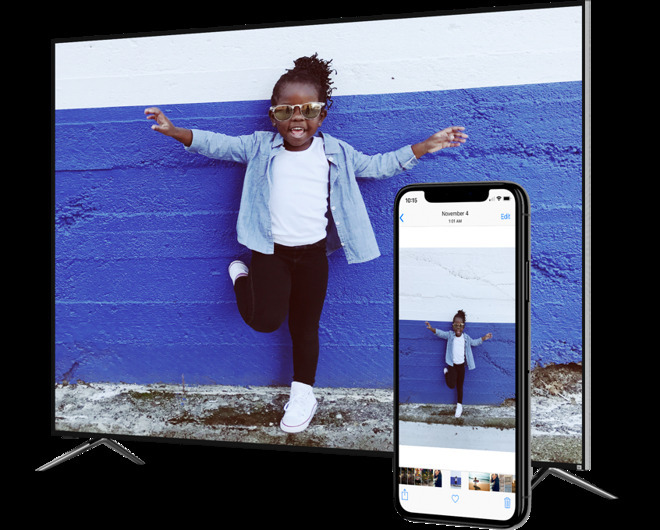 AirPlay 2 will allow people to push photos, video, and audio to Vizio TVs. It will also enable some limited Siri control on devices like iPhones and HomePods, and integration into HomeKit automations. Through Apple's Home app people will be able to turn a TV on or off, change volume, and even switch inputs. Siri controls will include the ability to play music, movies, and TV shows. SmartCast 3.0 incorporates Amazon Alexa and Google Assistant, making Vizio's lineup the first to support all three major voice assistants. Samsung surprised the tech industry on Sunday by revealing itself as the first TV maker to promise not just AirPlay 2 compatibilty but a native iTunes app. Until now AirPlay 2 has been limited to speakers and receivers, and iTunes to Apple hardware and a Windows app. Apple is presumably laying the groundwork for its upcoming streaming service, due to launch sometime in 2019 with $1 billion or more in original shows and movies. While the first-party video could be free on Apple hardware, the company may also be aiming to sell subscriptions to outside services, and eventually its own paid content. Limiting access to Apple platforms would likely make it hard to turn a profit. AppleInsider will be attending the Las Vegas Consumer Electronics Show starting on January 8 through January 11 where we're expecting 5G devices, HomeKit, 8K monitors and more. Keep up with our coverage by downloading the AppleInsider app, and follow us on YouTube, Twitter @appleinsider and Facebook for live, late-breaking coverage. You can also check out our official Instagram account for exclusive photos throughout the event. Televisions are like hard drives. For every person that will never buy another X, and prefers Y, There is one that will never buy another Y, and prefers X. If that's your best understanding of market dynamics, join the lemmings buying shares of GE because it's cheap! Meanwhilw - as previously noted - since we no longer touch Samsung with anyone's 10-foot pole, we've been more than satisfied with our Vizio TV purchases. My wife's response to the article was, "wonder if Vizio will rollout a firmware update to add these features to the 2018 P-series" we have in the living room?